This image shows the first output of a program that converts two black and white images into a pair of interlocking 3D models. The models comprise a ridged surface that presents one image when viewed from the left and the other image when viewed from the right. One model represents the white pixels from both images and the other model represents the black pixels from both images (displayed here in blue). Is there a name for this kind of display? I’m sure I’ve seen folded posters or other artwork that utilizes this effect, but without knowing applicable terms I haven’t had much luck finding examples. The present implementation is a proof of concept. 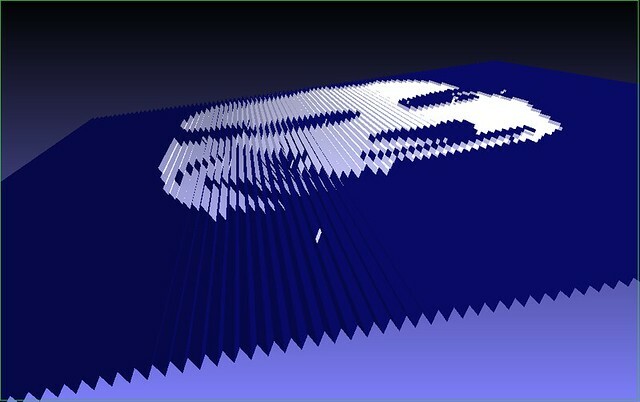 Only the ridged upper surface is currently generated. The plan is to generate a solid base as well, with the eventual goal of producing a two-piece panel that can be printed as single assembly with a dual-extruder 3D printer like the Makerbot 2X. I’d like to make it available as a web site. Posted on Saturday, November 16th, 2013. Here’s a physical print of the sample scene from my heightmap to STL program! Posted on Tuesday, November 5th, 2013. 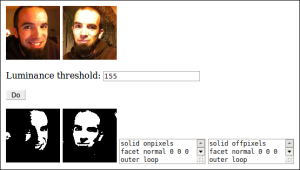 Hacked together a little tool called hmstl. It converts a heightmap – a grayscale image in which brighter pixels are interpreted as higher elevations – to STL, a format suitable for 3D printing. Posted on Wednesday, October 30th, 2013.